THE SIMPSONS: This may be an odd nitpick, but it’s kind of strange THE SIMPSONS’ 29th season concluded with an episode about Bart’s near-death experience and the season 30 premiere had…the same backdrop. Very different stories, but just a weird overlap. Personally, I loved, loved, loved hearing Emily Deschanel and Gal Gadot playing themselves on the show—their SIMPSONS personas portrayed the movie versions of Marge and Lisa, respectively. 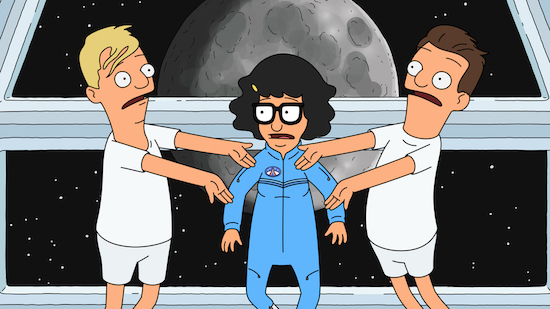 BOB’S BURGERS: Tina being boy-crazy is nothing new, but a full-on musical episode about it? Perfect. The homages were great, and the episode was just so purely fun. And it was great to have BOOK OF MORMON’s Andrew Rannells and Josh Gad, plus HAMILTON’s Daveed Diggs and Rory O’Malley as guest voices in the episode. GOD FRIENDED ME: This is a very, very earnest show. Brandon Micheal Hall should be a star, and Joe Morton is a pro at giving powerful speeches. It very much feels like a lighter PERSON OF INTEREST, with God (via Facebook) communicating who needs help versus an A.I. Part of it feels dated (Facebook being the social media platform of choice; even the optimistic, feel-good state of the world), but I could also see this breaking out as a comfortable show to just tune in to. FAMILY GUY: It’s not the first time a Fox show has poked fun at the in-show ad, but my goodness, the 9-1-1 joke brought on the biggest laugh of anything else I watched all week.